That there has been disruption to ferry and tunnel passenger and freight services at Calais and Coquelles for some days now, due to a combination of industrial action and refugee incursion, is well known, and has been aired across the media. But the thought that the hacks writing the stories might become personally affected has focused minds, and caused an almost hysterical outpouring of shock horror demands. The Super Soaraway Currant Bun attempted humour: “CALL TO SEND IN OUR ARMY … Softie Calais goes ballistic … Frenchies are atrocious” screams the headline. The Celtic and Inverness Caly Thistle original was better, but hey ho. 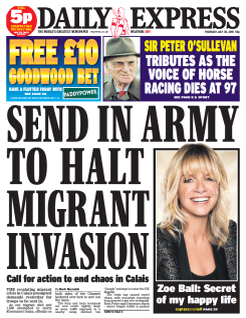 The Express simply demands “SEND IN ARMY TO HALT MIGRANT INVASION”. There’s been a “migrant invasion”? I blinked and missed it. But pride of place goes to the Mail. “As Cameron preaches abroad about slave labour, migrants besiege Tunnel to join OUR black economy and MPs demand … CALAIS: SEND IN THE ARMY”. I mean, one of them tried to get into Nigel “Thirsty” Farage’s car, so things must be desperate. Also desperate is the Mail, which has called Andrew Percy a “senior” Tory MP - he has no ministerial rank, and has been in the Commons just 5 years - because he says what they want to hear. What does Percy say? “The situation is now clearly out of control and it is clear that the current arrangements are not working and that the French are unable to guard against these infringements of our border … It is time we considered more radical options, including the use of the Army. The British people expect our border to be secure and the Government must do whatever it takes to achieve this”. Farage, by the most fortunate of coincidences, is of like mind: “To make sure we’ve actually got the manpower to check lorries coming in to stop people illegally coming to Britain... if in those circumstances we can use the Army or other forces, then why not?”. And, as Jon Stewart might have said, two things here. One, the most recent incursions, at the Channel Tunnel terminal, are most definitely on French soil. We do not deploy our armed forces in other countries unless they have agreed the deployment with our Government, unless it is a hostile action. We are not at war with the French, despite the ranting of the tabloid press. And two, this is a case of civil unrest, and that is not a matter for the army. In any case, why the sudden interest in what is happening in Calais and the surrounding area? Ah well. Daily Mail Comment gives the game away there: “The Calais shambles may have been building for months, but make no mistake: we are now witnessing a crisis which is having devastating repercussions across Britain. Family holidays in mainland Europe, long planned and saved for, are being ruined”. Yes, now that the hacks and pundits are being directly affected, and can’t go off on their holidays, it’s a crisis and the army has to be called in. Otherwise they couldn’t have given a stuff. Our free and fearless press are just a shower. An absolute shower. Since all the migrants are clearly "aspirational" enough to get this far, you'd think the neocon crackpots dahn in Lahndan would welcome them - even cockney loonies might leave off tattooing, body piercing and stealing long enough to bow the knee to the Suits at Canary Wharf and help them in their quest to "get competitive" with cheap labour. I'm delighted to note the whole capitalist ponzi scheme is daily coming apart at the seams. It won't be long before their messenger boys and girls in mainstream media finally twig they too are dispensable. Then what's the betting we get - as we did with Thatcher - a gang of neocons weeping at their own redundancy, but not at anybody else's. You know, like when the Screws was closed. If only the migrants KNEW just what a stinking pile of corrupt far right garbage this country has become at every level, and that they're fated to become nothing but disillusioned pizza deliverers and ditch diggers. That's the real tragedy. If only Queen Mary hadn't lost it back in the 16th century after a cut back in resources - sounds familiar? WiKi - the French under Francis, Duke of Guise took advantage of a weakened garrison and decayed fortifications to retake Calais....... the sluice gates, which could have flooded the attackers, remained unopened". Ah! What they could have doone with a Boris water cannon. Today's hilarious* Mac cartoon. "'There it is, lads. The land of plenty, where the police ignore burglaries and cannabis farms...'"
* I'm using the Mail's unique definition of "hilarious". Reminds me of the Downfall spoofs but in this case a rattled Cameron is pointing at maps and demanding the deployment of reserves from the Border Agency. A nervous Home Office minister clears his throat and reminds Hitler, sorry, Cameron, that in 2010 he had ordered cuts to the Agency's budget by £500m and got rid of 5300 staff. As usual when the going gets tough Dave isn't here. He's swanning round Vietnam drumming up business for the northern powerhouse (seriously) and pretending to be statesmanlike. I'm amazed anybody falls for it.